This small storefront is easy to miss. Once you go inside you find towering bookshelves over narrow paths littered with more stacks of books growing from the floor. The whole place seems like a movie set about a secret bookstore where strange things happen. Needless to say this place is located in the French Quarter. 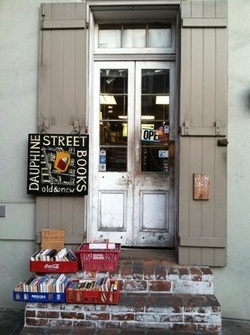 This place is full of books about New Orleans. Among the dusty tomes are fiction, history, cookbooks and more. A jam-packed bookshop of used and rare books - a bibliophile's dream. It's the type of place you wished had an easy chair so that you could sit there by yourself and just read.